During the process of your removal Britannia Devereux are fully aware that storage may be a requirement for a period of time prior to delivery. 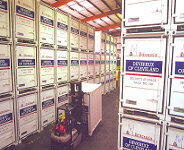 Short or long term storage can be provided by Britannia Devereux. In our warehouses we have the latest concept in Container Storage Steel Containers, which we specially designed ourselves to combat the two major catastrophes and homeowner fears, fire and flood damage. The Britannia Group have over 40 of these modern steel containers. On site we have CCTV operating 24hrs a day and when all the staff leave site, we have security to patrol the premises. This takes place 365 days a year. On the day of your removal into Store the removal operatives will transport the container directly to your home where you can see the process of loading occur from your own front door. All furniture will be wrapped in blankets and a full inventory recorded, the containers will be closed and secured on site. This process eliminates the need to double handle your furniture and you can be confident that you know exactly what you have in store and that unless you need access to the containers, the contents will be delivered out store in the same containers and are exactly as you last saw them. Please feel free to come along and view our storage facilities and obtain any advice you may need.